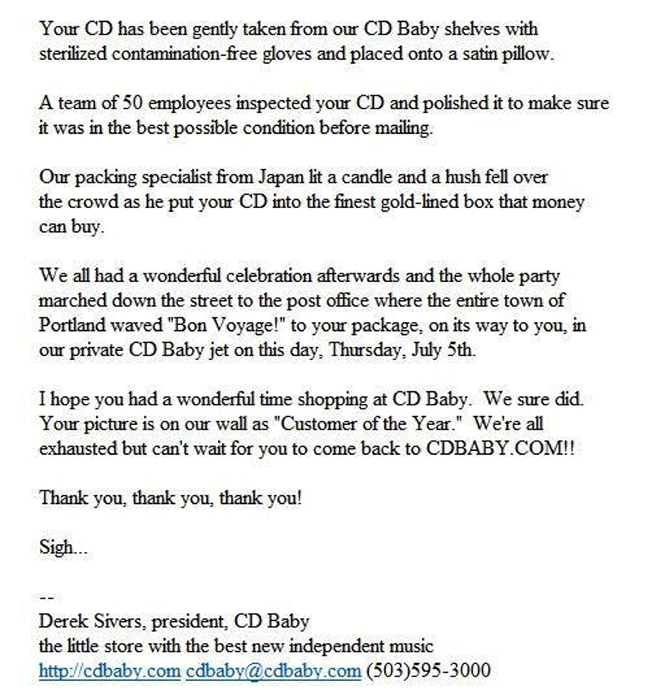 There aren’t many canonical examples of great email marketing, but CD Baby founder Derek Sivers is responsible for one. That one goofy e-mail created thousands of new customers. But it’s often the tiny details that really thrill someone enough to make them tell all their friends about you. One witty email won’t change your business, but a series of little moments can create a great experience for your customers and keep them coming back. Those moments can pad your bottom line too. Even just a 5% increase in customer retention can increase profitability by 75%. This got me thinking — who else is using email to delight their customers? I went searching through my own inbox for examples and came up with seven great ones. These companies aren’t relying on email to do the heavy lifting, they’re sewing a customer-centric mindset into the fabric of their business. These examples may seem minute. In some case, they are. But little details — no matter how small — get noticed. These emails all make their recipients life a little easier, better or happier. And that’s something we should all aspire to. You’ve got a free drink waiting! The Starbucks rewards program delivers good news all the time. The result is happy customers (like me) who are eager to open their emails. What I love about the email below is that it simply delivers good news. It doesn’t ask the customers to take any action. 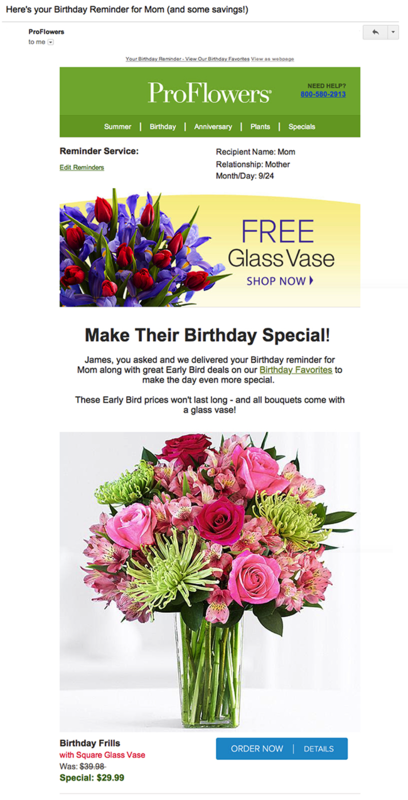 This is a good example of an email as a layer in a customer-centric company. The only reason the email is sent at all is because of the rewards program — you can’t send an email like this without a good relationship. You want to have at least one email that’s designed solely to make people’s day. The Blue Apron newsletter signup on their website is pretty convincing. A new recipe every week? Sure, I’ll sign up. Blue Apron could use the free food as a hook to get new subscribers, but they don’t because it’s their way of delighting the subscriber. It’s an unexpected surprise. A lot of companies will say, “Join our list and get a free e-book.” We don’t say that. But when people sign up, we give them something free. It’s a nice surprise. And who doesn’t like a nice surprise? On one hand, it’s another email in the inbox. 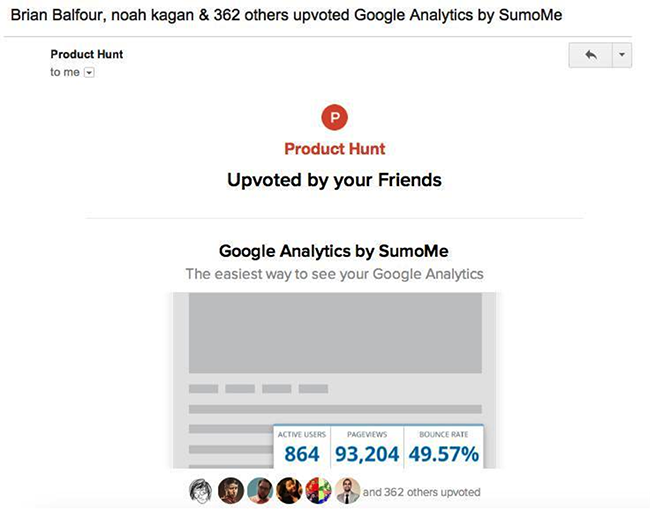 But on the other, Product Hunt recognized that eight of my friends are all interested in the same product. They included their names or photos in the email as social proof. It makes sense that I’d be interested too. I actually really appreciated this email since it was so contextual. It kept me in the loop without begging for my attention. Be careful with emails like this as it’s easy to annoy people. This one works because it’s triggered as a result of my network’s common interest. You’ll need some smart engineering to pull this off but if you can do it and do it well, you’ll be providing extra value to customers. 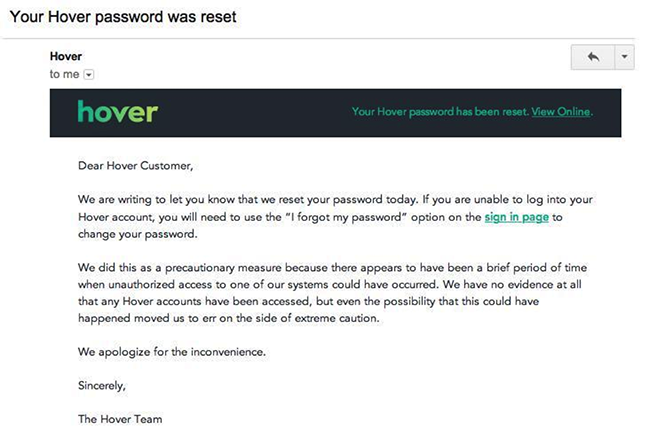 I almost never receive emails from Hover. When I do, it’s something useful like this. I’m so used to getting value and utility from their emails that I always open them. The best part? They don’t ask for anything in return. There are so many ways to deliver utility in the inbox and updates like this are one of them. Your customers deserve to be informed about product updates, security issues and changes to their account. Send them emails that deliver value without asking for anything in return. It feels more like correspondence than marketing, and your customers will appreciate it. Got it? You can download the book in three different formats! That may not seem like a big deal, but think about how you read long-form content. PDFs are great on a desktop computer but the Kindle format is preferable if you open the email on a tablet or smartphone. 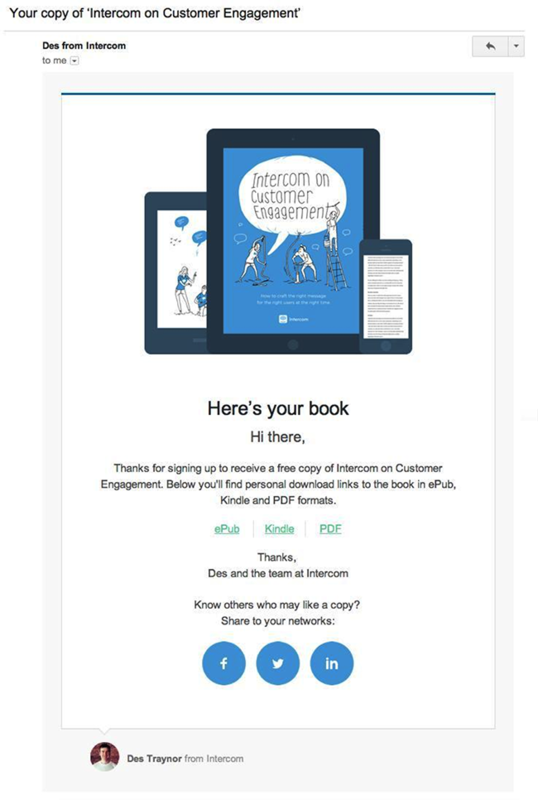 No matter which device or platform customers are using, the emails you send (and their attachments) should create an awesome experience for readers. It’s all about putting yourself in their shoes. Intercom does just that, which makes receiving this email a pleasure. When you sign up for a new Evernote account, they send a series of five onboarding emails. …People want progress bars. But why are they so powerful and effective for engagement? Building this into your onboarding helps users feel accomplished. And because Evernote broke down their app into small, digestible chunks, it’s easy to get started. Everyone is happy. This is a good example of contextual marketing. It’s personalized based on my past purchase history and arrives at just the right time. It’s not hard to make your customers smile. If you have 30 minutes to check Facebook and Twitter, then you have time to add personality to your marketing. Have you received an email that made you smile recently? Let us know in the comments.